Jilly's Essential Preset Collection is HERE! One of those most frequently asked questions I get is how I edit my photos for Instagram. I’ve had a passion for photography for years … I love setting up the perfect shot, making sure the lighting’s just right and editing it so that it looks perfect in my feed! Back in the day, I used a DSLR for my blog photos, having Shay snap my blog photos, or having Justin take them while we were at home or on vacation! Years went on and as my brand and the team grew, we decided to bring on a photographer, and Mackenzie joined the team! As convenient as it is to have Mackenzie on hand for our weekly blog photoshoots, I still LOVE taking photos of the kids, Nacho, and Justin in my spare time. Between being a mom of two, shooting Love It Or List It, and running my business, I’m ALWAYS looking for ways to save time editing my iPhone photos for Instagram. Using these tools has allowed me to quickly snap my photo, apply my preset, make customizations, and VOILA! Easy peasy. Now if only everything in life could be this easy! LOL!!! This collection of presets is inspired by the fresh, bright, and airy photos you see on my Instagram feed, combined with professional Lightroom editing experience. Whether you’re working with beautiful bright diffused daylight, indoor natural light, or yellow artificial dark lighting, we’ve got you covered with EIGHT editing presets for your desktop and mobile devices. Whether you’re a mom on the go, a newbie photographer or someone simply looking to up their Instagram game, these presets are for you! For $65CAD, you can have access to all of your favorite Instagram editing styles for both your Desktop computer AND Mobile devices to create beautifully edited images on the go and professional quality images from your laptop or desktop computer. This bundle contains my collection of 8 mobile and desktop-ready presets developed to fit a variety of different color scenes, lighting situations, and styles. They work for iPhone, Android, AND DSLR images, so you can use these even if you only take photos with your iPhone! Also included is a PDF and videos that will instruct you how to install your presets in both Lightroom programs! Make sure you read and watch it all after you’ve downloaded the presets to get the most out of them! These presets are designed for editing in all versions of Adobe Lightroom, including mobile devices! To make sure you are purchasing what’s right for you. Make sure to read the Jilly Preset FAQ prior to purchases due to the digital, non-returnable nature of this product, refunds are not possible and all sales are final. There are a few very important things to consider when purchasing presets. You will notice that all of the photos we use for the blog and for my Instagram feed are light, bright and airy. This isn’t necessarily the result of applying a preset with a click of a button, but many other factors that contribute to a properly exposed photo! For the blog, we use professional equipment and have a team on hand to help create the most beautiful setup possible! While they are very easy to download and install on your mobile and desktop, it is VERY important to follow ALL the directions carefully. It may seem like a lot of work to get them up and running, but once they’re set up they are a BREEZE to use! Please FOLLOW these instructions to ensure that you don’t run into any troubles! Below you will find a description and intended use for each preset. There are some that will work for different lighting scenarios, so you can play around see which one you like best for a certain image! This preset is inspired by all the BEAUTIFUL greenery found in the orchards where we live here in British Columbia. While I LOVE the rich green colour of the leaves and grass, aesthetically I prefer a much more muted and softer green in my photos and in my Instagram feed. This preset will soften your greens and brighten your skies, resulting in a film-like dreamy photo. This preset is BEST used on an outdoor photo with a lot of greenery. It will work for both cloudy or sunny days! This preset is designed for those crazy bright days where everything is saturated with light, causing your colours to look too rich and overwhelming. We called this preset “peachy” because using it will results in all of your colours softening and becoming a bit more (we also happen to have a new addition to our family named Peaches – how fitting!). It’s best used on photos taken in broad daylight and will soften and desaturate the colouring resulting in a blushy, peachy toned picture. One of my favourite presets in our Essentials package! The best time to take photos is at a time called “Golden Hour” when the sun is juuuust about to set and you get this beautiful soft light peaking through. This is the prime time to take photos, if you can swing it! There is even an app that will tell you when Golden Hour is wherever you are! This preset will simply enhance the beauty of that soft golden light, adding a hint of blush and soften your colours, making that sunset POP! I designed this preset because I LOVE taking photos of my family. While I would love to get the perfect shot of them outside at Golden Hour, most of the shots I get of my kids are me chasing them around the house trying to get them to sit still (am I right mamas?). We are such homebodies … and this preset is designed for any photos taken indoors using natural light that have people in them. One of my favourite places to take photos is inside my home. If you’ve been following me for any amount of time, you know that white is my most used “colour” in my home, and it serves as the backdrop for most of the photos we take for the blog. Whether it’s using my bedding, a marble slab, my counter tops, my vanity … We love using white to create bright and airy photos. 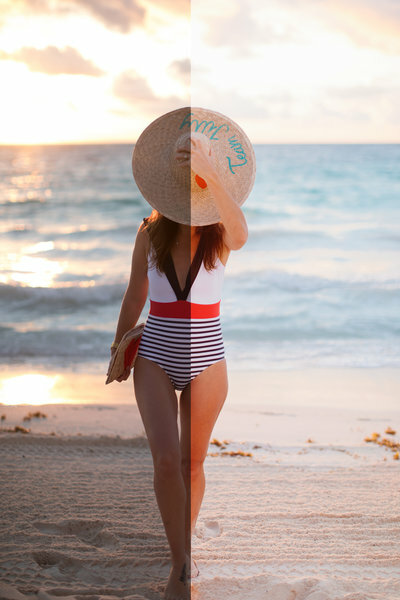 This preset will make your whites more white, and create a beautifully bright image. This preset is best used for photos taken that incorporate white in your home using natural light. I have SUCH a love for interiors photography. With the right lighting and set up, photos can bring spaces in your home to life and create the most welcoming feeling. This preset was designed to apply to photos taken in your home. Similar to the Crisp Whites preset, these settings will make the whites in your photo pop and make your space look DREAMY and bright. In an ideal world, every photo would be taken in soft, diffused natural light. Well, life isn’t PERFECT and sometimes a shot is too cute not to capture just because. This preset is called “Cozy Love” because it’s meant for photos taken in the evening when natural light isn’t available. Using these settings will soften the yellow hues that are given off from artificial lighting, and brighten and whiten your image! This preset is best used on photos taken in the evening or dark when bright natural light isn’t available. Snow is nature’s best ‘diffuser’ – it makes everything so soft and beautiful. It’s one of my favourite backdrops! Here in Canada, we’re so fortunate to have the dreamiest snow-covered landscapes to shoot in. This preset is designed to bring your colours to life against a snow background. Use natural light only. Aside from the “Cozy Love” preset, these presets are meant to be applied to a photo that has been taken with natural light. Turn off all of your overhead lighting, and try to ensure the photo you’re taking is near a window or a source of natural light. Try to avoid DIRECT sunlight when taking photos outside. Make sure your subject is lit by the sun either from the side, or from the back, but avoid taking photos where the sun is shining right onto your subject, or it will be way too bright and harsh. Wipe and clean your phone lens so that your photos don’t look muddy or dirty! If you’re taking photos indoors, try to find the brightest source of light, preferably by a window! Download the Lightroom app on your phone and make sure you have the most recent version. While we provide instructions to download the files on to your phone, we HIGHLY recommend also downloading them to your desktop computer and saving them to a hard drive so that you can access them at a later time. Make sure the preset files have been properly saved on your phone. Visit your camera roll once you’ve saved it to ensure it’s been saved properly. When you open the file on your phone, make sure it loads properly before copying the settings. You will need Adobe Lightroom installed on your computer. You can visit Adobe.com for available plans! We recommend using the Lightroom Classic program for these. When you download the desktop files, make sure you save them into a folder that you can easily find on your computer (I’d suggest your desktop! ), and ensure you backup these files so that if you ever transfer to another computer you have them on hand. When you paste the files into your Lightroom folder, you will have to RESTART Lightroom in order for them to populate on the left-hand side of your develop module. Adjust your tint by sliding the tint tool to the right or left. Shop the Jilly Presets HERE! For additional help, tips, and advice make sure to check out the video below and read up on our FAQ’s which you can find HERE! I already LOVE the presets, but a little reminder (to anyone reading) that the difference between all Mobile and Desktop Presets is between JPG files and RAW. Lots of people may shoot a DSLR, but not shoot in RAW and still would need to use the JPG preset packs. Hi Jillian, I am really excited about these presets and wanted to confirm that they are also good for Android. I believe you had mentioned this in an Insta story. Also, would you suggest these presets for taking food photos? Hi Jillian, I’m excited about the presets and wanted to confirm if they can be used on the Android as well. I think you did mention this in an Insta story. Also, would you suggest these presets are useful for a food blog? Thanks! Will you be making an action set that can be used with Photoshop programs like creative cloud? Can you purchase these in the US.? Can you purchase these in the US? How long are you having the limited time sale for? I am so excited that y’all decided to release these! I cannot wait to dive in and use them. Do you have to keep the blank file/picture on your phone once you have loaded them I to Lightroom? Or are you able to delete that download? So sorry to hear you’re having issues with your downloads. Can you try manually renaming your files and removing the .txt at the end?? Hi! Excited about these but just wondering about printing these photos. Once you apply the preset and save it, does it print well if you order prints from a website? Or is it more of a “filter” like on Instagram that really looks nice on insta but does not print well? Also curious about if you apply a preset and then want to convert to black and white? Does it work like that? Or would you forgo the preset and just change to b&w in Lightroom or on the phone itself. Very excited to purchase these if they print well! Thanks! How do you convert the price to USD for US buyers? I just ordered and can’t wait to start using your presets for a new world of possibilities! I purchased a DLSR about 9-10 years ago and really loved learning how to improve my photography skills. Once I switched to the iPhone, I really quit carrying my camera due to convenience and space in my purse. 🙂 Sadly that means my skills were put on the shelf. I have been watching all the instastories, posts, etc on these presets and didn’t really think I would be interested. I went ahead and bought them tonight and immediately downloaded them to my phone. SO. MUCH. FUN! I’ve been playing around with them this evening and have found them to be really easy to use and I love to see what I can create out of the pictures in my camera roll. BRAVO! Here’s the bad news…I’m still a terrible photographer. But, thank you for sparking the creativity in me again. I’m still too chicken to post them to instagram, but once I get there, I’ll be sure to use the hashtag. LOL. Hi, I have Adobe CC and downloaded Lightroom through there. The presets now need to be in .xmp format (camera raw). Any tips on how to convert the files and load them for the new version of Lightroom? These are SO great!!! Team Jilly, you knocked it out of the park with these presets! The instructions and support material were so carefully thought out that it made it simple to follow along. Thank you for all of your hard work – these are going to make it so much easier to edit my photos in an aesthetic that is more my style. Well done! Hello! I purchased the presets but they are coming up as a txt file (I did try to remove and rename) but they won’t import into Lightroom – Any suggestions / tips 🙂 Thanks! I’m about to purchase your presents and cannot wait to start playing!! hoping for help with one thing – I love the whitewashed, muted colour look, however we may use these for our local Market Garden business this summer, any advice on still letting the greens of our crops, reds of tomatoes, etc pop?! I am using a Mac and have Lightroom CC. When I try to import the presets they will not select. I have other presets that are xmp. files and they upload fine. I was wondering if you had any tips on how to import the Jilly presets with this issue.